The Art Institute of Chicago is one of the world's premier art museums, housing a collection that spans 5,000 years. Monday – Wednesday 10:30 a.m. – 5:00 p.m., Thursday 10:30 a.m. – 8:00 p.m. (Free 5:00 p.m. - 8:00 p.m.), Friday 10:30 a.m. - 5:00 p.m., Saturday – Sunday 10:00 a.m. – 5:00 p.m. The Art Institute is open every day except Thanksgiving, Christmas, and New Years Day. 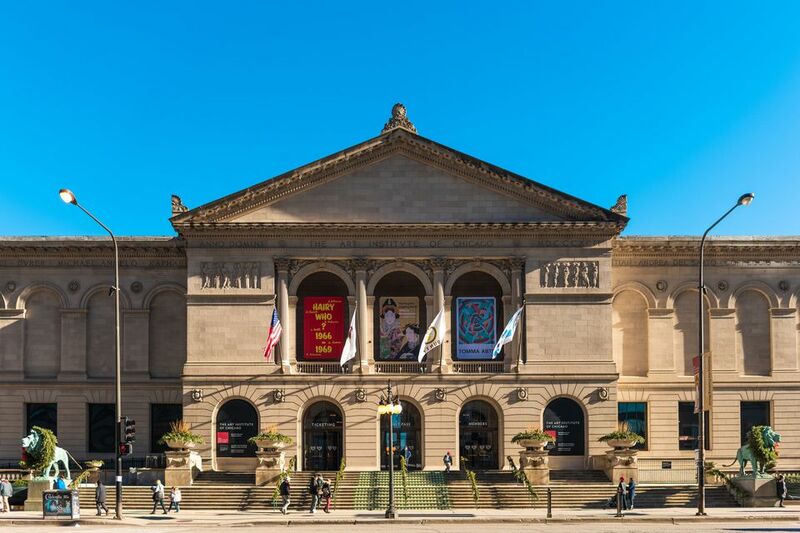 The Art Institute of Chicago, flanked by its well known bronze lions, showcases a tremendous collection of art in a number of different mediums -- paintings, prints, drawings, sculptures, photographs, video, textiles, and architectural drawings. The Art Institute also plays host to a number of traveling exhibits such as works by Monet and Van Gogh. They also have an ongoing series of lectures, performances and workshops taking place every day. While strolling through the Art Institute, a number of pieces will be instantly recognizable, as the Institute is home to famous works such as those by Mary Cassatt, Georgia O'Keeffe, Grant Wood, Edward Hopper and more, ranging in all manners of style from impressionist to post-modern. The highly anticipated Modern Wing of the Art Institute of Chicago opened in 2009, at a cost of $300 million. The striking building designed by Renzo Piano provides a stark contrast from the classic Beaux-Arts style of the main part of the museum -- which is fitting, because the art inside the two structures is dramatically different as well. The 264,000-square-foot addition marks an tremendous increase in the Art Institute's contemporary art offerings, as opposed to previously only being known for displaying more classic works. The Modern Wing houses many permanent collections, with plans to regularly accommodate important traveling exhibitions.